Meet Jude. Jude and his brother were both born with Albinism. Their unique condition proved to be very difficult for their mother. After years of being mocked and ostracized by the community because of her children’s Albinism, she abandoned Jude and his brother. Jude says his sister (pictured above) mistreated him because of the misinformation and folklore she had heard regarding Albinism. He also recounts numerous occasions at school where he was singled out, teased, punished and treated differently by teachers and students because of his Albinism. We first met Jude in 2016 and after hearing his heartbreaking story, we knew we wanted to help. We were excited to be able to present our Albinism sensitization program at his school, Nungua Methodist Preparatory school, located in the suburbs of Accra. The students enjoyed the program and learned a lot about the cause of and reality for those living with Albinism. They now understand that Albinism is not contagious, is not Jude’s fault, and it does not make him different than anyone else. As a result, his fellow students promised to stop teasing him or anyone else with Albinism ever again. At the end of the program, students shared what they want to be when they grow up. When Jude’s turn arose, he passionately announced that he would like to be an attorney when he grows up. It was a powerful exercise that demonstrated to the other students that Jude has hopes and dreams just like them. We hope that with continued presentations of our sensitization program, Jude and others born with Albinism can look forward to a bright future free from mistreatment and misunderstanding. After the sensitization program, ENA provided custom notebooks with positive inscriptions about Albinism on the cover page and the back cover. 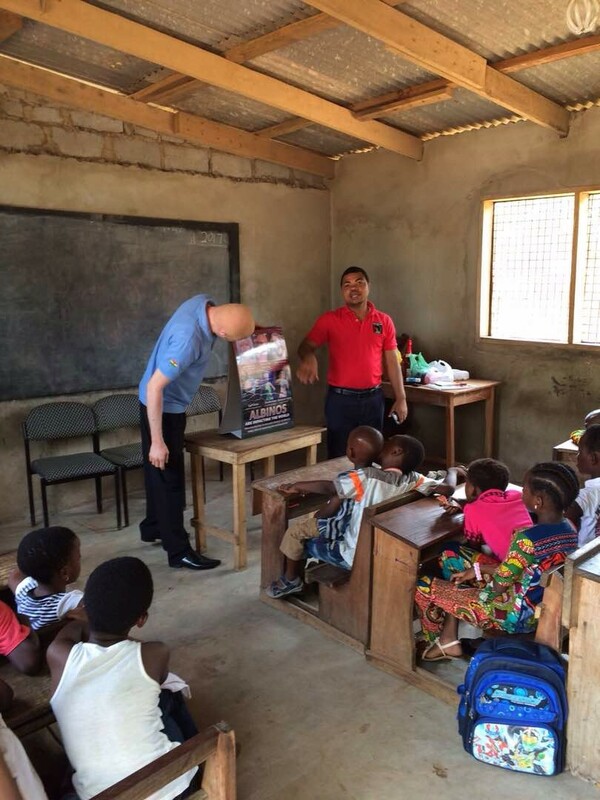 The school authorities and the students were extremely appreciative for the materials, information, and training. Thanks to ENA, these students were able to get the information necessary to combat folklore about Albinism and improve their treatment of those with Albinism like Jude. To help our sensitization program continue to spread awareness about Albinism, please consider donating here!